Blake Shinn is back in the saddle after five months. 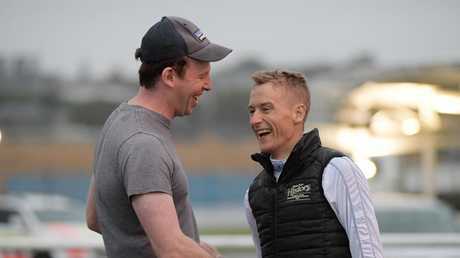 A wet Sydney summer's morning wasn't going to dampen Blake Shinn's spirits as the champion jockey made a comeback to trackwork riding at Royal Randwick. Shinn has not been on horseback since suffering a serious neck injury in a barrier trial fall last August. But after receiving a medical clearance from his doctors yesterday, Shinn was one of the first at trackwork. Shinn said his lengthy rehabilitation period had been a frustrating and challenging period. "I had to miss the spring carnival which was disappointing but it's an exciting time to be coming back with the autumn just around the corner,'' Shinn said. Shinn revealed his weight soared to 63.5kg during his time out of the saddle but he has been working hard on his fitness the last two months. "My weight is back down to around 57kg and I feel as fit as I can be without being on a horse,'' he said. He will ride in at least seven barrier trials at Randwick tomorrow as he continues to build towards a race riding comeback at the end of this month. Shinn is regarded as one of the nation's elite jockeys. He has ridden 20 Group 1 winners including the 2008 Melbourne Cup on Viewed. He was coming off a career-best season where he rode the winners of 139 races with his mounts earning more than $14 million prizemoney. Shinn was riding Pacific Legend in a 1045m heat in August when the horse seemed to become unbalanced near the home turn and the jockey slipped from the saddle. 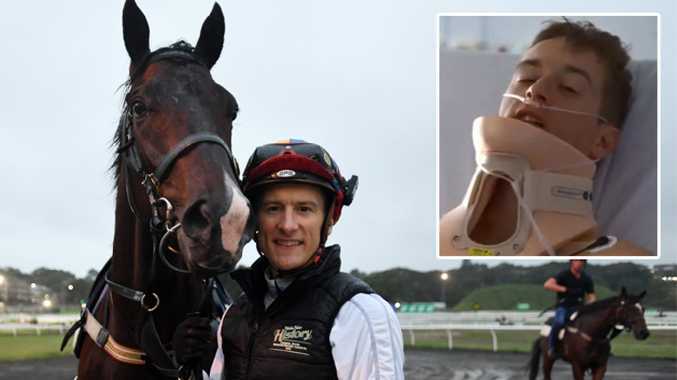 The regular jockey for three-time Group 1 winner Happy Clapper, was taken to nearby Prince of Wales Hospital where X-rays revealed he had fractures in his C1 and C3 vertebra. He was coming off arguably a career-best season where he rode 80 Sydney winners to be second in the jockeys premiership prior to the fall. Shinn had also won five Group 1 races - three on the outstanding Happy Clapper including the Epsom-Doncaster Handicap double.